This project has an educational benefit and could be categorized as a Kindergartner-in-Training activity, although it can be tailored to fit any grammar school grade. 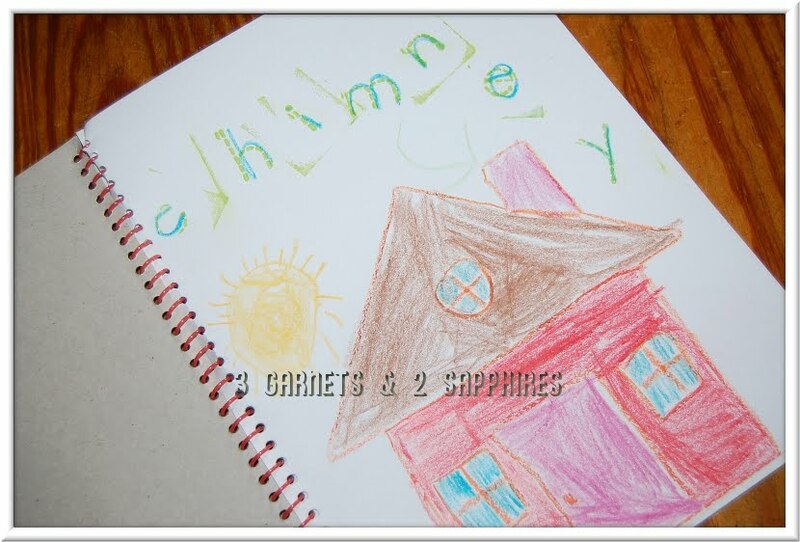 The goal is to create a picture book that your child can be proud of based on a theme of phonics and spelling. This is a long term project that cannot be completed in one sitting. Our 4.5 year old twins were able to complete the cover and one page of their books, while our 7.5 year old son was able to finish the cover and two pages of his book. 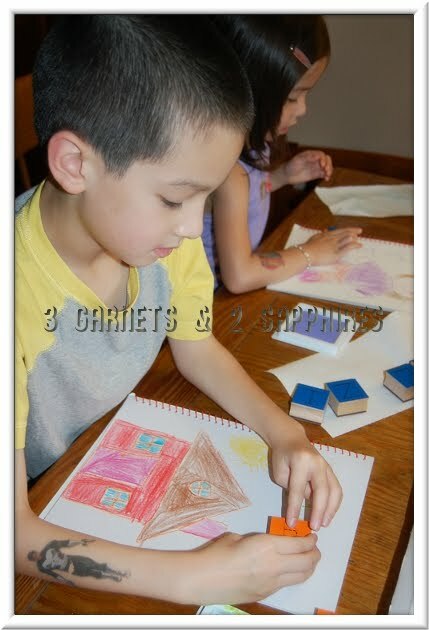 Ask your child to create a picture book of everyday objects that he or she likes or has an interest in using tracing shapes and dot-to-dot stampers. Step 1. 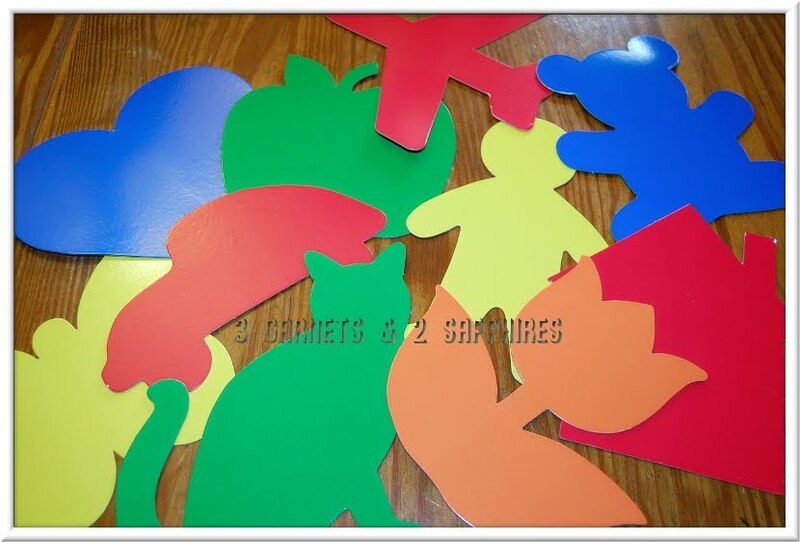 After deciding whether the book should be in a landscape or portrait format, ask your child to choose a shape that he or she likes or has an interest in. Have him or her trace the shape onto the cover, making sure to leave enough room for his or her name. 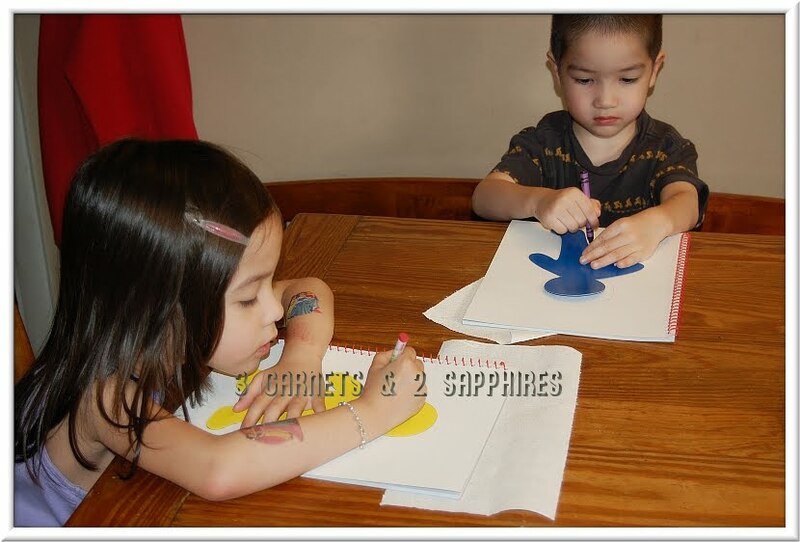 Then ask your child to fill in the details of the shape and color it in with crayons or markers. 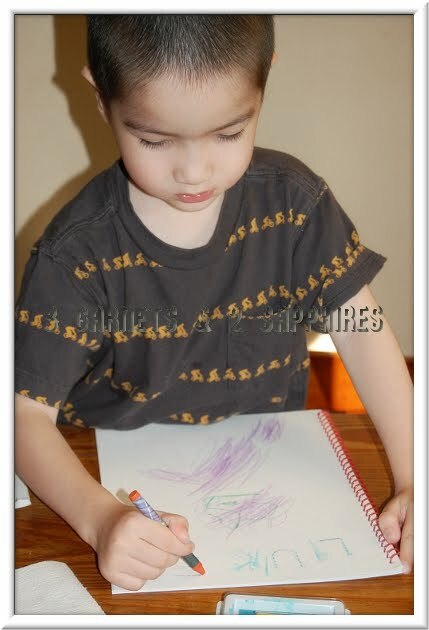 Tip #1: We chose the person shape for the cover, so that each child could do a self-portrait. Step 2. 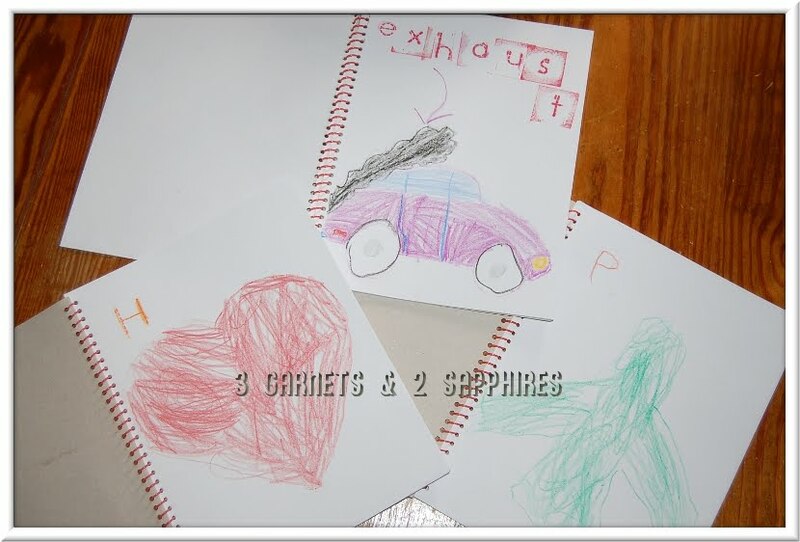 Have your child choose the color ink pad he or she would like to use (if you have more than one). 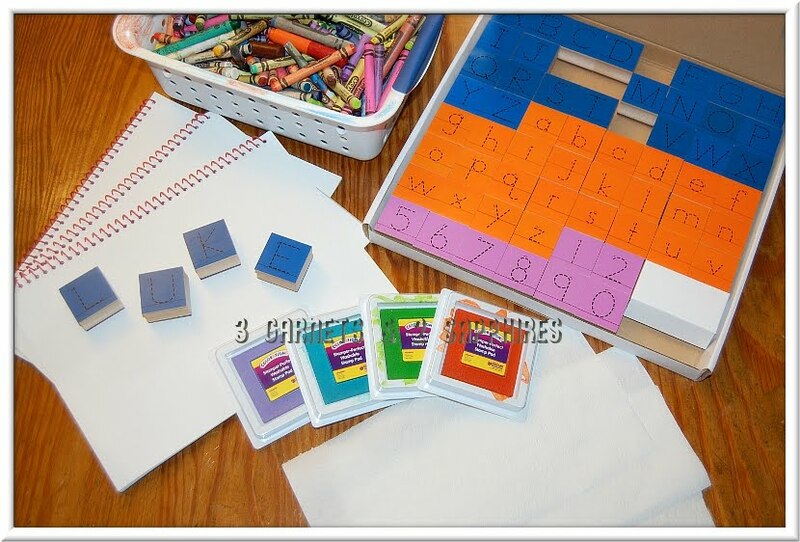 Then help your child select the correct letters from the Tracing Stampers to spell out his or her name. 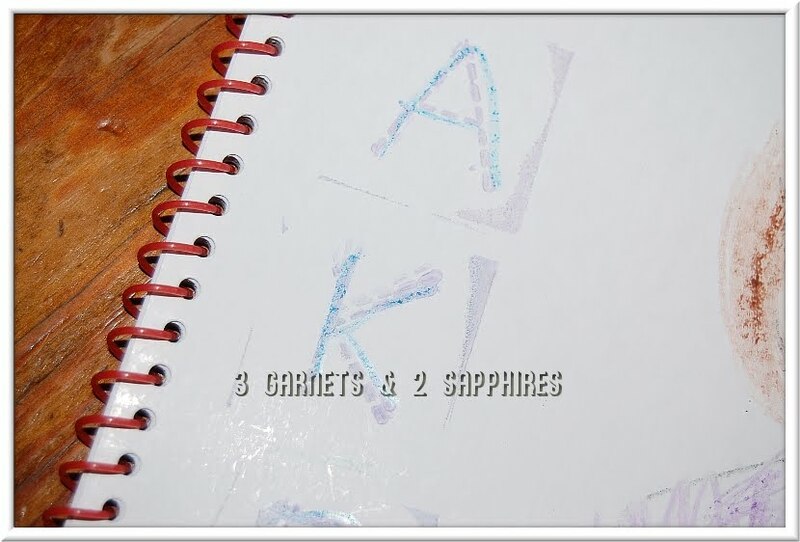 Next, either you or your child should use the letters to stamp out your child's name on the front cover. Tip #2: For our preschoolers, we used all upper-case letters to spell out their names. For our 2nd grader, we used one uppercase stamp for the first letter in his name and then lowercase for the rest. Use your judgement as far as where your child is with letter recognition. Tip #3. 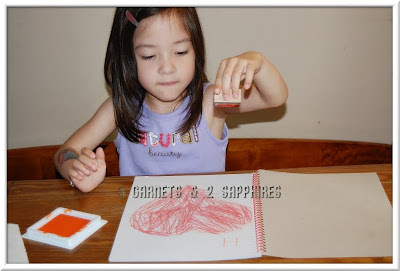 After using each stamper, wipe off the excess ink on a clean paper towel. Step 3. Have your child trace over the dotted lines of each letter using a sharp crayon or a marker. Step 4. Repeat Step #1 for the first inside page of the book. Step 5. 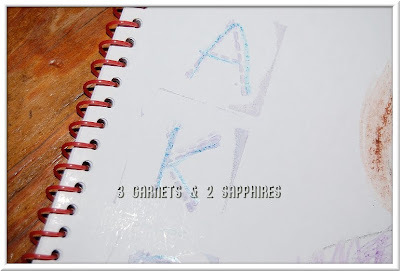 Use a letter stamper to stamp the first letter of the object onto the page. (For example, our daughter chose to put a heart on her first page. So the letter she stamped on that page was an uppercase "H".) Then have your child use a crayon or a marker to trace over the dotted lines forming the letter. Tip #4: For an older child, you can ask him or her to think of a word related to the object that he or she does not know how to spell. Here are the results of our project . . .
As previously mentioned, our preschool-aged daughter chose a heart for her first page and her twin brother chose a plane. The two words our 2nd grader chose to use in his book so far are "chimney" and "exhaust." 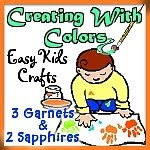 If you need to stock up on art, crafts, and school supplies for your child, visit DiscountSchoolSupply.com. Through August 26th, you can receive an additional 15% off your order when you checkout using Code: 4THEKIDS. Thank you to Discount School Supply for providing complimentary products samples for us to use in this project.